Despite the wet winter in 2017, climate change will pose severe challenges to California’s future water supply. In the last post I reported that Gov. Brown has declared California’s drought emergency officially over. The state has plenty of water for the next year. This post explores the implications of this wet winter for California’s long-term water status. I first looked at this topic in a 13-post series that ran during the summer of 2015. The series starts here. It contains a lot of information about California’s water supply and consumption. I concluded that at some point in the not-too-distant future California would experience a significant permanent water deficit. The #1 cause of the deficit would be climate change, which is projected to result in a significant reduction in the size of California’s snowcap. The #2 cause would be population increase. I performed the analysis myself because I could find no sources that did anything similar. I’m not going to repeat that analysis in this post. Rather, I’m going to report a couple of new reports that confirm the concerns I had in 2015. Figure 1. Source: California Dept. of Water Resources. Figure 1 illustrates the problem California faces. Almost all of California’s precipitation falls during the winter. Some of it gets temporarily “locked up” as snowpack on the Sierra Nevada mountains. Demand for water, however, peaks during the summer. California has many man-made reservoirs that release water during the summer and fall, and the state depends on the melting snowpack to recharge the man-made reservoirs as water is drawn from them. 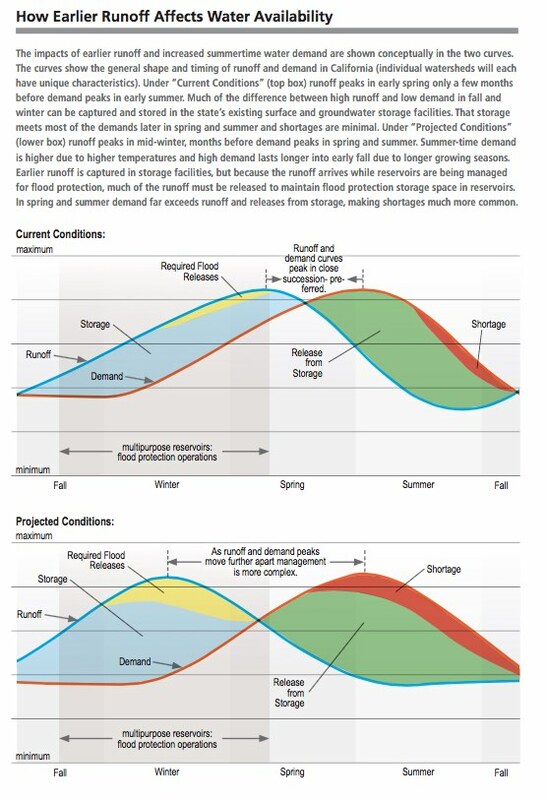 In Figure 1, the blue line represents runoff and the red line represents water demand. You can see that moving the date of maximum runoff earlier in the year increases the amount of water that cannot be captured into storage (yellow area). It has to be dumped; see the post on Oroville Dam to see what happens if the volume of water being dumped gets too high. It increases the amount of water that must be released from storage in the summer and fall. The amount released is now larger than the amount of inflow the reservoir receives, resulting in an increased water deficit (the blue area represents water received, the green area represents water discharged equal to the size of the blue area, and the red area represents the deficit). There is a water deficit in average years, but it is small, and a winter with slightly above average precipitation can make up the deficit. Moving maximum runoff earlier in the year increases the size of the deficit; now only a much wetter year can recharge the reservoirs. Figure 2. Source: California Dept. of Water Resources. Figure 2 includes two charts. The first chart shows the percentage of precipitation in California that occurred as rain from 1948-2012. If precipitation occurs as rain, it is not snow and can’t add to the snowpack. On the chart, the black horizontal line is the mean percentage across all years. Red columns represent years with above average percentage of rain, the blue columns below average. There is variation between years, but you can see that the red columns cluster to the right while blue columns cluster to the left. That means that on average an increasing percentage of precipitation is falling as rain. Thus, on average, unless annual precipitation undergoes a sustained increase (which hasn’t happened and is not projected), California’s snowpack will shrink, because what once was snow is now rain. 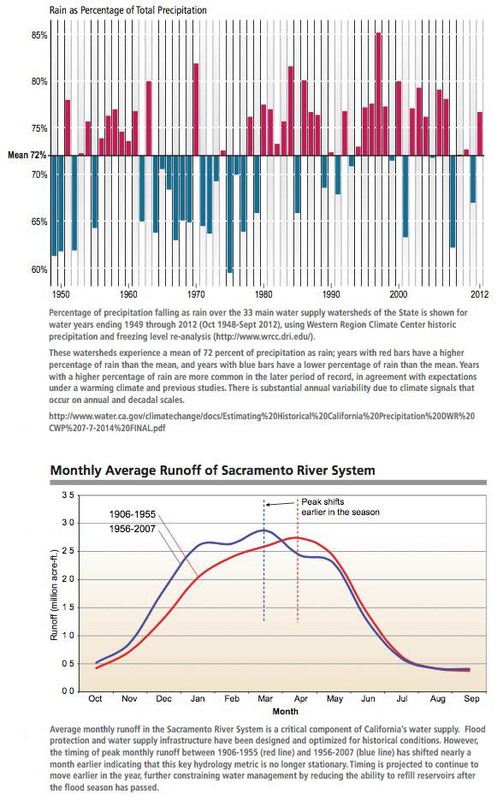 The second chart in Figure 2 shows runoff measured on the Sacramento River. The red line represents the 50-year period from 1906-1955, while the blue line represents the 52-year period from 1956-2007. This is the specific problem that was discussed conceptually in Figure 1. You can see that runoff has moved earlier in the year by about a month. Figure 3. Source: National Centers for Environmental Information. Why is more precipitation falling as rain rather than snow, and why is melt occurring earlier? Because of increased temperature. Winter is when the snow falls in California, and it is when the state receives the bulk of its precipitation. Figure 3 shows that the average winter temperature (December – March) has increased more than 2°F. In addition, if you look at Figure 3 carefully, you can see that the rate of temperature increase accelerated somewhere around 1980. The runoff chart in Figure 2 chunks the data into only 2 groups, each about 50 years long. Because of the acceleration in the increase in temperature, I believe that if they had chunked the data into 3 groups, each about 33 years long, the change towards earlier snowmelt would have been even greater than the one shown. How dire is the threat is to California’s snowpack? It depends on which climate projection is used. The projected effects of climate change depend very much on how humankind responds to the threat. If we greatly reduce our GHG emissions immediately, the climate will warm less; if we don’t, it will warm more. Figure 4. Source: California Dept. of Water Resources. 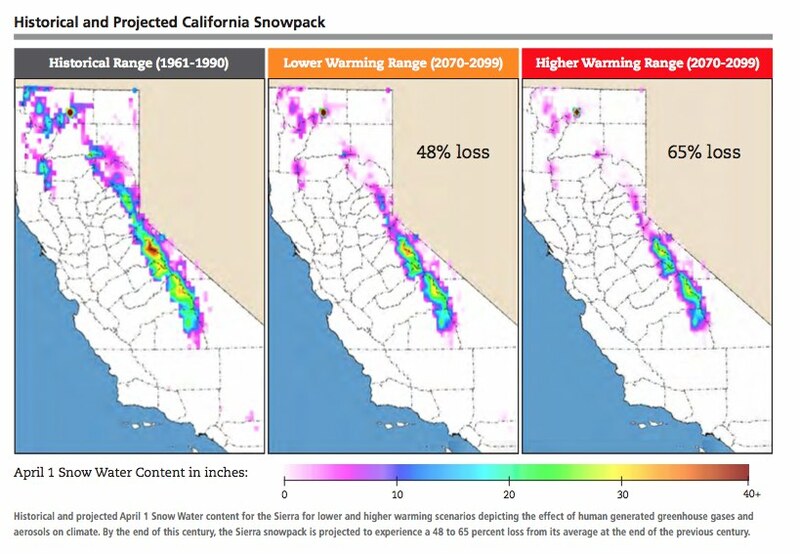 Figure 4 shows the historical size of the California snowpack plus 2 projections. The middle map show the projected size of the snow pack if warming is less. The map on the right shows its size if warming is more. You can see that, even under the low warming scenario, a loss of 48% of the snowpack is projected. Under the high warming scenario, a 65% loss of the snowpack is projected. These projections are for the end of the century. In my original series, I estimated the loss of snowpack at 40% by mid-century. That is not too far off from the high warming scenario. And I have to say, the evidence suggests that so far the world is operating under the high warming scenario, possibly, even worse. Surface water is not the only source on which California depends. California withdraws significant amounts of water from underground aquifers, especially in (but not limited to) the agricultural areas of the Central Valley. Aquifers can be compared to underground lakes, but don’t think of them as being like a big, hollow cave in which there is a concentrated, pure body of water. Rather, think of them as regions of porous ground, such as gravel or sand. In between the pieces of gravel or sand is space, and that space can hold water. Below and on the sides are rocks or clay that are impervious to water, which allow the water to be held in the aquifer. So long as the aquifer is charged with water, this is a situation that can last for thousands of years. If, however, water is pumped out without being replaced, then nothing occupies the spaces between the pieces of gravel or sand. If that occurs, the weight of the ground over the aquifer can compress the aquifer, reducing the amount of space available between the pieces of sand and gravel, reducing the capacity of the aquifer to hold water. When this occurs, it sometimes shows up as subsidence on the surface. In California, it is primarily the snowpack that feeds the aquifers. If a significant amount of the snowpack is lost, it will be less able to recharge the aquifers, and they will undergo increased compaction. Figure 5. Map of Permanent Subsidence. Source: Smith et al, 2016. As noted in my original series, significant subsidence has already occurred over California’s aquifers. More seems to be occurring every year. A recent study attempted to quantify the amount of water storage capacity being lost to compaction. The study covered the years 2007-2010, so it didn’t even include the recent severe drought (2007, 2008, and 2009 were dry years, but 2010 was 9th wettest in the record). The study covered only a small portion of the south end of the Central Valley Aquifer, yet it found that during those 4 years significant permanent subsidence had occurred (see Figure 5), resulting in a total loss of 748 million cubic meters of water storage, an amount roughly equal to 9% of the groundwater pumping that occurs in the study area. If this ratio held going forward, it would mean that for every 44.4 gallons of water pumped out each year, about 1 gallon of aquifer storage would be lost. During the recent drought many newspaper articles reported that there had been a sharp increase in the number of wells being drilled in the Central Valley, and that the depth of the wells had also significantly increased. This suggests an increase in the rate at which the water table is being lowered, which would lead to an increased rate of compaction. As the study notes, this is a loss that cannot be replenished; aquifer storage lost to compaction is gone forever. Dry periods become more devastating when they occur during hot periods. One reason the recent drought in California was so devastating was because it was a hot drought. A recent study found that climate change has already raised the temperature in the state (as in Figure 3 above), and will continue to raise it further, to the point that every dry year is likely to be a hot drought. The report concludes that anthropogenic warming has substantially increased the risk of severe impacts on human and natural systems, such as reduced snowpack, increased wildfire risk, acute water shortages, critical groundwater overdraft, and species extinction. The bottom line here is that we are talking about the effects of climate change. Climate means average patterns over long periods of time – 30 years at minimum. The current wet period represents only 1 winter. Just as one swallow doesn’t make a summer, so one wet winter doesn’t make a climate trend. For that matter, neither do 5 dry years. However, California’s increase in temperature is a long-term change that does make a climate trend, and every indication suggests it will only increase more. My conclusion is that this wet winter not withstanding, the concerns I voiced in 2015 over California’s water supply remain valid. As time passes, California will face increasing challenges meeting the demand for water (see here). The state will be unable to secure large new sources of surface water or ground water (see here), and will have to construct large, expensive desalination plants (see here). There will be sufficient water to supply human consumption if it is properly allocated (see here), but water available to agriculture will be reduced, resulting in a decline in California’s agricultural economy (see here). That loss, plus the cost of the desalination plants, will impact California’s economy (see here), as well as the food supply for the entire country. California Department of Water Resources. 2015. California Climate Science and Data for Water Resources Management. Downloaded 4/6/2017 from http://www.water.ca.gov/climatechange/docs/CA_Climate_Science_and_Data_Final_Release_June_2015.pdf. Diffenbaugh, Noah, Daniel Swain, and Danielle Touma. 2015. “Anthropogenic Warming Has Increased Drought Risk in California.” Proceedings of the National Academy of Sciences. Downloaded 3/30/2017 from http://www.pnas.org/content/112/13/3931. National Centers for Environmental Information. 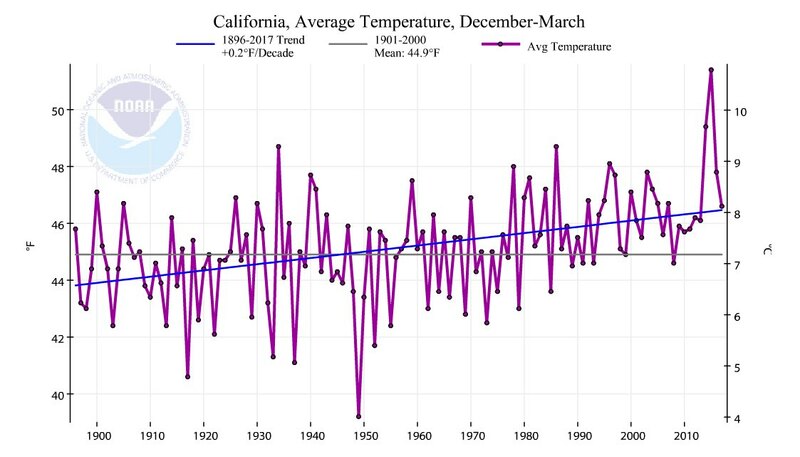 “California, Average Temperature, December-March, 1896-2016” Graph generated and downloaded 4/13/2017 at https://www.ncdc.noaa.gov/cag/time-series/us. Smith, R.G., R. Kinght, J. Chen, J.A. Reeves, H.A. Zebker, T. Farr, and Z. Liu. 2016. “Estimating the Permanent Loss of Groundwater Storage in the Southern San Joaquin Valley, California.” Water Resources Research, American Geophysical Union. 10.1002/2016WRO19861. Downloaded 3/30/2017 from http://onlinelibrary.wiley.com/doi/10.1002/2016WR019861/full. By mogreenstats in Climate Change, Weather Patterns on 2017/05/11 .